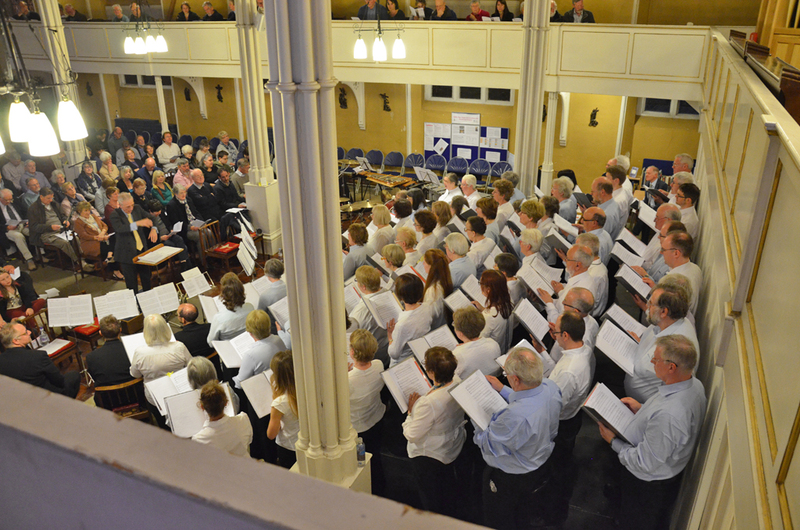 Evening had arrived on 23 April 2016 and the choir was ready after 18 months of planning and 3 months of rehearsing. 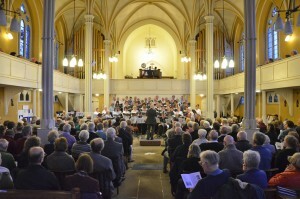 The organ was in tune, the brass and percussion in place and the choir lined up in the side aisles waiting for the opening announcements so they could go on stage. 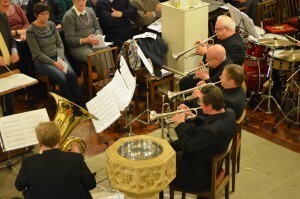 Off stage trumpets started the concert with Bill Strang's Prelude on the Hymn to St Magnus. Choir and brass first then a moment which choked me up every time - quiet chords on the organ with the vibraphone in percussion before the choir and brass joined in again and built the piece towards its dramatic conclusion. 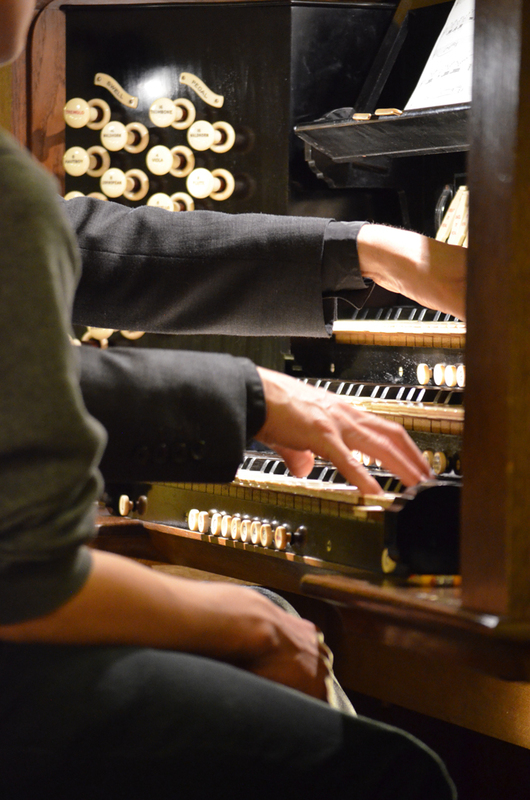 I thought it was a very special way to introduce the restored organ in this opening concert. 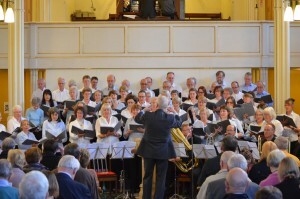 Bill Strang devised a programme which encompassed music which would have been familiar to the congregation of St George's Church in Edinburgh, such as the pieces by Andrew Mitchell Thomson (its first minister - we had sung 'Ye Gates' in the 2010 concert and it was good to revive it especially as the tune was written for St George's church), Robert Archibald Smith, John Thomson, Alexander Mackenzie (though his piece was composed after he left Edinburgh) and Robert Finnie McEwen who had been a stand-in organist during WW1 at St George's church. Paul Daggett played the first movement of Widor's Symphony No. 5 on the organ which gave the choir a break from singing and this piece showed off the wonderful variety of sounds now possible on the enlarged instrument which now has the 3 stops (Tierce, Nazard and Piccolo) which Henry Willis III planned in 1932, as well as the Waldhorn which was apparently installed in 1932 but stolen in 1962 after St George's church closed. The first half of the concert was rounded off with a sequence of 3 motets and 2 brass interludes by Anton Bruckner - Locus Iste was well known to the choir as we had been participating in some PhD research on pitch drift so had sung it every week for 5 months, Ave Maria and Ecce sacerdos were new to us and wonderful to sing, finishing off the first half with a majestic sound of organ, choir and brass. 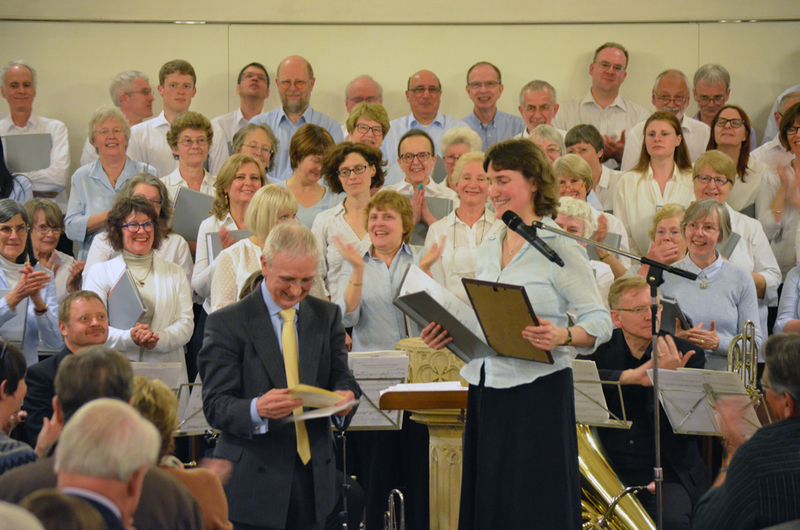 Liz Lane's new version of 'Antiphonary' for brass ensemble and percussion started the second half of the concert. It was inspired by the Berkeley Castle family illuminated book of liturgical texts and chants and melded some of the melodies found in that treasure as well as the contents of the castle, the music was still going through my head the next day. 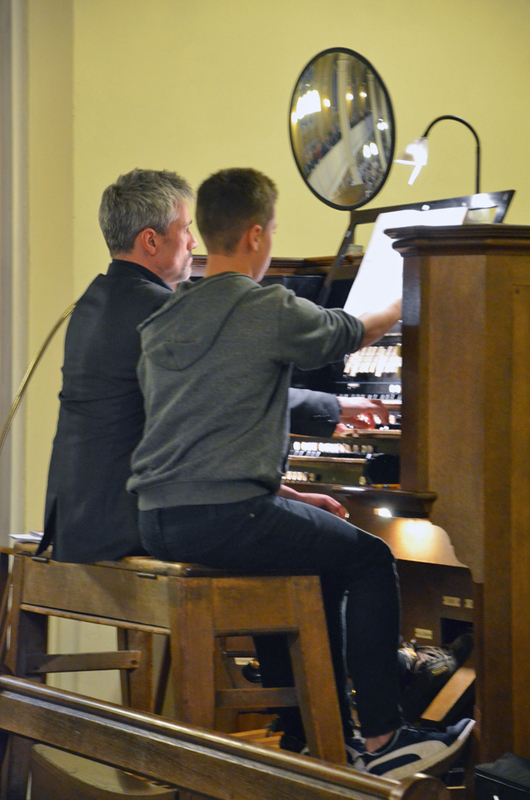 It was lovely to have the composer in the audience enjoying this first performance of this particular arrangement. 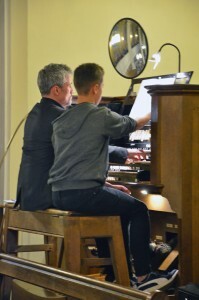 The programme also included 3 pieces by William Bowie, Bill's music teacher at The Royal High School who had been the last organist at St George's church before it closed in 1962. One of these 3 pieces (Faith) the OU Choir sang at the concert in 2010, the other two were new to us. 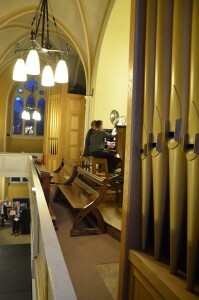 All three were composed and performed after St George's church closed however they displayed Bowie's close understanding of choral and organ sounds which would have been nurtured and extended during his time playing this Willis organ. They were short but challenging to learn - in the event the choir succeeded in bringing off good performances of all three. Then came the climax of the concert - John Rutter's Gloria which was written in 1974 when he was involved in teaching at The Open University. 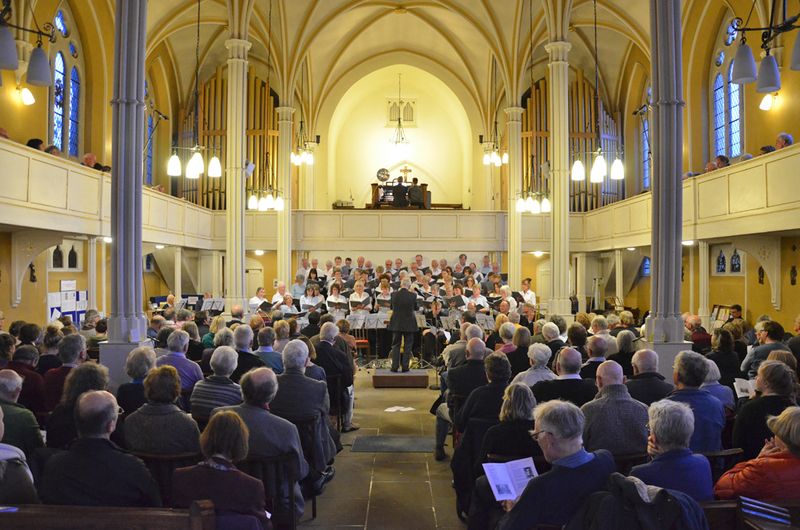 This included all the performers and the organ in large measure so was a wonderful, exciting way to conclude the evening of music. 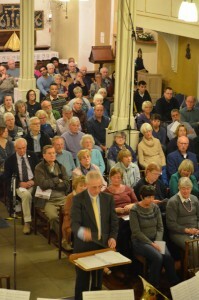 Bill had written programme notes for almost all the pieces and supplemented these with his introductions during the evening (see below). He was following in the tradition started by one of the composers featured twice in our programme - John Thomson (son of Andrew Mitchell Thomson) who was Scotland's first Professor of Music at Edinburgh University. 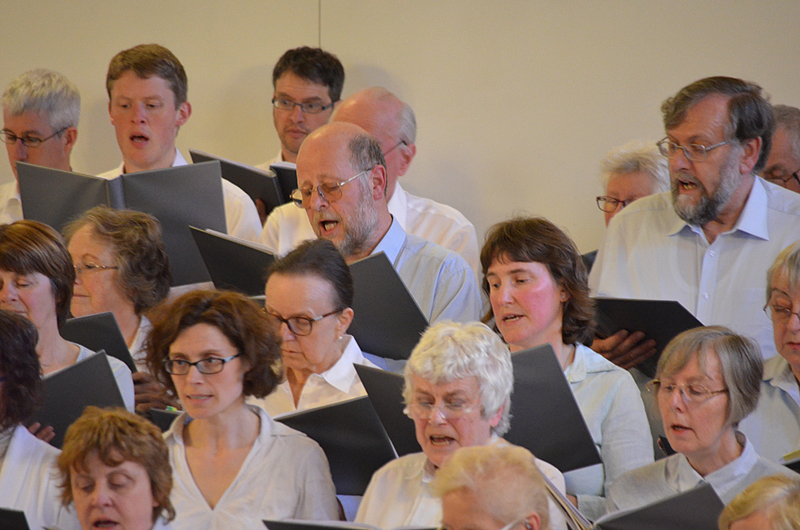 We loved singing his Benedictus and Osanna for semi chorus, soloists and choir during the first half. Bill had transcribed this from the original manuscript and had arranged the orchestral parts for organ, it worked very well. 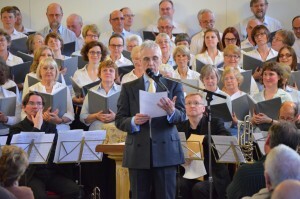 At the end of the concert I presented Bill and the choir with a pipe dedication from Music for All @ SMSG - it had to be a pipe in the Choir section of the organ and I chose an original Father Willis reed, Corno-di-Bassetto (clarinet). 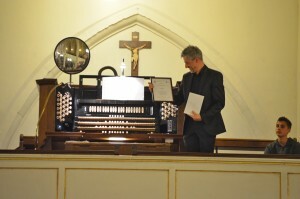 Paul Daggett also received a pipe dedication to thank him for accompanying the choir on the organ at its opening concert. 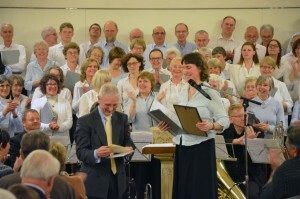 Liz Lane and Liz Camp (OU Choir chair and soloist during one of the pieces) received flowers, other soloists received chocolates and all the brass and percussion players as well as those who helped put up the screen were given thank you cards. "What a wonderful inaugural concert! 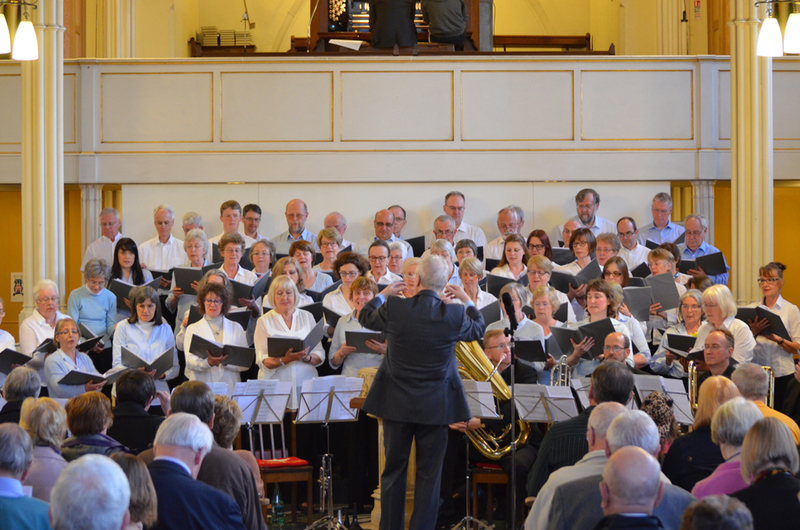 Brilliantly interesting programming, good layout for singers and audience, and a jolly good performance overall – one of the best events we have been to in SMSG! Compliments to Bill Strang and all involved." "The evening was special yesterday, all at the church do so much, it is appreciated. Seemed very odd to be seated 'the wrong way round' - most enjoyable evening. Wish you all well." "How wonderful to hear the organ with the brass (and percussion and choir) all playing at the same pitch." "The Bruckner motets were fabulous especially with the organ, brass and choir in the loud bits." "Magnificent Widor which I remember listening to regularly on an LP which my brother bought many years ago – Marcel Dupre at St Sulpice. Lovely to hear all the different colours." "I was captivated from the start and continued to be so for every piece: it was a truly memorable evening for the audience." "Not only did the rafters ring, but the columns and stained glass too"
I would like to thank everyone who helped in any way to bring this inaugural choral and restored organ concert to fruition - Bill Strang and The Open University choir, all the other musicians, Fr Ross Northing and the churchwardens for their support and the wonderful band of volunteers at the church and choir friends who managed front of house so ably, turned chairs, sorted out staging, screen and instrument hire and storage. It was complicated to arrange but worth all the effort for musical enjoyment and the bonus was that the organ fund benefited from £1,118.74 after expenses as the choir generously donated their share of the profit to the upkeep of the instrument. 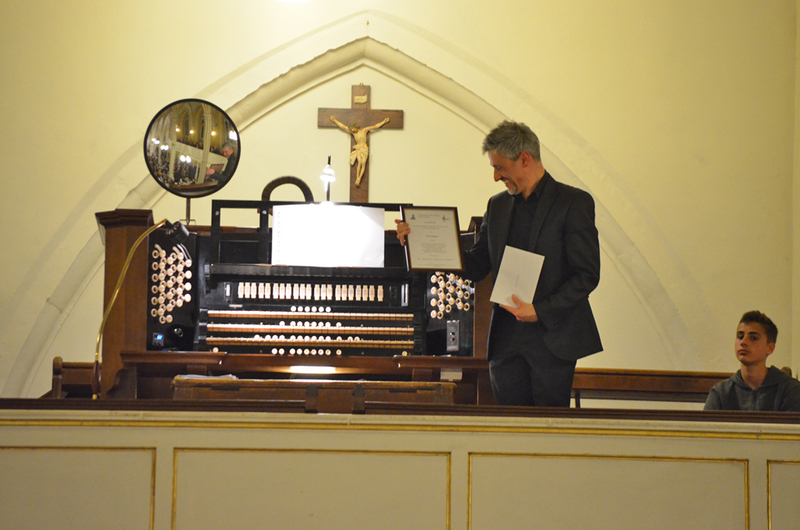 It was an excellent start to our 10 weeks of Organ Restoration Celebration and we continue to enjoy the fact that 10 years of fundraising, generous support from the Heritage Lottery Fund and a great love of music in our community made this possible.